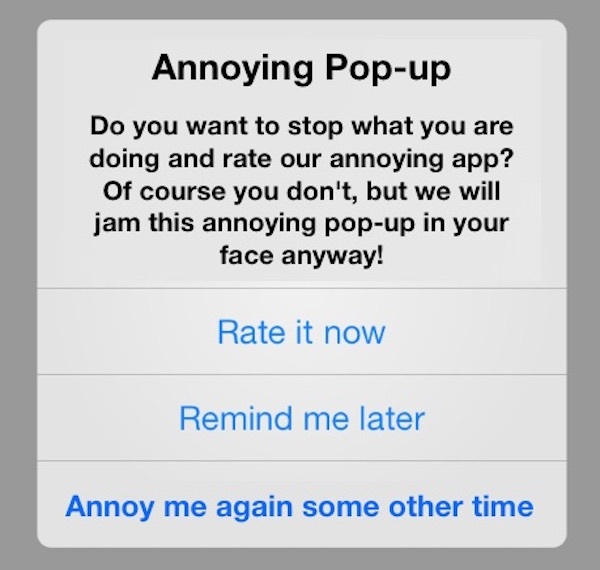 Are you tired of iPhone and iPad apps nagging you to rate and review their apps with pop-ups? The most annoying in-app rating and review pop-ups usually arrive in third party apps and say something along the lines of “review our app” and offer a few options of reviewing the app now, reviewing the app later, or attempting to stop reviewing the app completely which seems to just postpone the review pop-up slightly longer but never entirely. The pop-ups take over the entire iOS experience and must be acted on to dismiss, fun! Be annoyed no more, fortunately you can now disable these review and rating pop-ups in iOS completely. The ability to disable app review and app rating pop-up alerts in iOS requires iOS 10.3 or later to be installed on the iPhone or iPad. If you don’t have this feature it’s likely because you are not on the latest version of iOS available. Update: This feature was only available to beta users, it seems to not be available in current versions of iOS 10.3 – let us know in the comments if you experience something different. With this setting disabled, you should stop seeing any of the app review requests popping up on your iPhone or iPad. If you decide you miss those app-rating pop ups, you can easily go back to Settings to re-enable this feature by toggling “In-App Ratings & Reviews” back to the ON position again. Something for users to keep in mind: app ratings and app reviews can help developers as well as contribute to an apps success, so if you do like (or hate) an app you should take the time to rate and review it. Reviewing and rating apps can be done through the App Store in iOS or iTunes on the Mac. I know a lot of developers like these pop-ups because it may get some users to review their apps who otherwise wouldn’t, but my personal opinion is these type of pop-ups are annoying and should be disabled by default. Instead, Apple should offer an easier way to see, edit, and review apps via the App Store app. There is no setting for “In-App Ratings & Reviews” on my iPhone 7 running 10.3. Is this an early April Fool? It’s on my Iphone with 10.3, I came from the beta. Are you running final public or did you update from beta? Not on my update,Same for me as that parameter,IN APP RATINGS & reviews is not on my 7. April Fools Day is early this year. This has nothing to do with the ipad, so why tell us it has? I just upgraded to 10.3 and the setting is not there. I did not participate in the beta. I have done the update to 10.3 and that toggle is not there. iOS 10.3 iPhone 5s, the toggle does not exists. I’m also using iOS 10.3 and I don’t see that function either. I have the review setting toggle but i am running iOS 10.3 from the beta build, was it not released in public? That would be weird. Clean install of 10.3 on iPhone 6 and 7plus, but this switch is missing. You erased your iPhones, did a DFU reset, installed iOS 10.3, and restored the apps from a backup? 5s with 10.3, no toggle. I have iOS 10.3, no toggle on mine either! Bummer. Just updated to 10.3 because of this article – on a 6s w/ 10.3 and I see no toggle option, here or under the new top-level Apple ID menu. I’m in Germany and don’t have it either. 5s with 10.3, nope. nada. 6S running 10.3. No Ratings & Review toggle on mine either. Have latest update on 6s. No toggle. I’m using the 10.3 public release on iPhone 6S. Not there. I’m in Oz, and have yet to update, but after reading this, I may wait a bit. looks like Apple deleted this functionality – maybe to appease developers? User choices, gone! DanR is right. Depends on your country / region and your carrier. I live in Hong Kong and when I compare the menu in settings with an iPhone (same iOS version) from a friend that lives in mainland China, there’s a lot of differences. On iPhone 6S running latest iOS 10.3.2. public beta 1 the toggle is not there. I’m in Australia, and the option isn’t on mine either. It’s punishing the user for installing the app. (b) Review the App, and tell everybody how annoying this feature is. Maybe the developers will get the message. iPhone 6S with 10.3, not there. iPhone 6 doesn’t have this option. This probably wouldn’t apply to to the IOS updates that bug you!!! No it wouldn’t because it’s not the same. iOS updates bug you by telling you to install the update, whereas apps bug you by asking if you want to rate the app, it being already installed and you having already used it at least once. or anywhere in settings, for that matter. 9.7 iPad Pro with 10.3; not involved in beta program. There’s no toggle for in app rating & reviews. Sorely want the option. First I try not to rate an app too soon. Second, the requests come at inconvenient times. Iphone 8s+ running iOS11.1.2 and no nozzle. iphone 7Plus. The toggle does not exist. I’ve just downloaded iOS 10.3 and done all the restarting thing, and no toggle switch, for those annoying app ratings. If an app has this kind of insistent pop up, I delete the app. iPhone 7, new, out of the box, update from 10.2.1 to 10.3 and there is not toggle switch..
Nobody reads the article I guess? It says pretty clearly in the article this is a beta feature. Nobody bothers to read, they just complain. No wonder everyone complains all the time. The part about the betas was not there when the article was first published, it was a later update. Some of those who commented did so before they could read that. You came a bit late. The VERY important thing the article says pretty clearly is Update: This feature was only available to beta users, it seems to not be available in current versions of iOS 10.3. Before, the article said that if you don’t have that feature it’s because you didn’t update to 10.3 yet. Oakland CA – not here either. 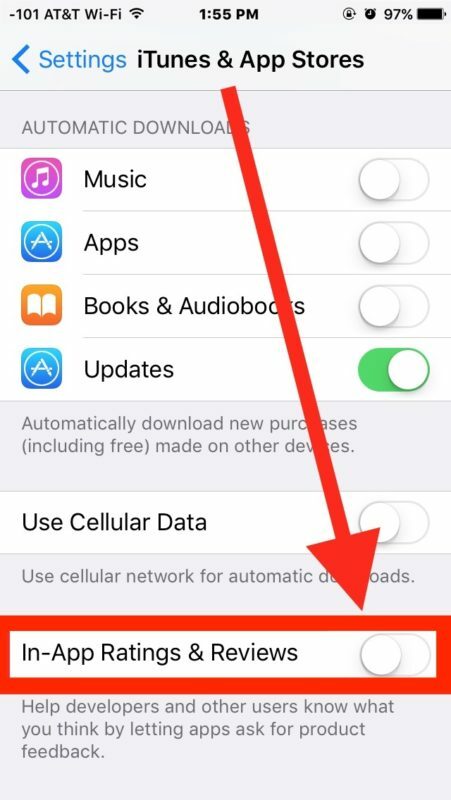 Apparently Apple no longer wants this to be an option for most (or all) of their mobile device users, so they’ve removed it. The net result: We’re going to be stuck with these annoyances because ultimately, Apple feels they contribute to its bottom line. This is the kind of behavior I associate with cable companies and timeshare resellers. Concur. Fageddaboutit. Ain’t gonna happen. I’ve updated an iPhone 6+, an iPad Air and an iPad Pro all upgraded to the last iOS. No toggle. Disabling app rating requests would be nice, if it existed. Not on my 10.3 either. Don’t do beta testing. Maybe it’ll be in 10.4 final??? Wish this was in final because whether you’ve rated an app before or not, doesn’t affect the popup, most times even if rating from the pop up in the app. I’m running the newest Beta softare (iOS 10.3.2). It’s also not there. I have 10.3.2 and it’s definitely not there. Hmmm. Did Putin’s dudes remove it? I am running iOS 11.0.3 (no bata), the “In-App Rating and Review” is a valid toggle in the “iTunes & App Store” setting.